The Wellness Philosophy That Strives to Empower and Touch the Heart, the Mind, the Body and the Soul of All Residents. Based on the Latin word, “well-being or wellness,” Salus™ by Solvere is our trademark wellness philosophy that incorporates Masterpiece Living®, a positive aging program based on years of research that strives to empower and touch the heart, the mind, the body and the soul of all residents, no matter what their physical or emotional challenges. Salus by Solvere is rooted in a proactive, holistic approach that addresses the multiple dimensions of wellness – social, intellectual, spiritual and physical. 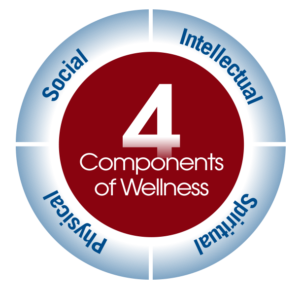 Salus takes a comprehensive approach that concentrates on the Four Components of Wellness, each one a critical element of creating a path to meaningful living. Physical: Living a healthy lifestyle through physical activity and proper nutrition as a means to stay strong and flexible, and limit disease and disability. Spiritual: Continuing lifelong search for purpose and meaning through faith-based involvement, volunteerism and service, and enjoying meaningful pastimes. To age successfully requires a physically active and mentally stimulating lifestyle, strong social engagement, an environment that supports your unique goals and – perhaps most importantly – a sense of purpose and meaning. Salus, powered by Masterpiece Living, equips residents with the tools they need to meet these goals. For select managed communities, Salus is powered by Solvere partner Masterpiece Living, a cutting edge company that emerged from the groundbreaking 10-year MacArthur Foundation research around successful aging. Wellness programs at the country’s most visionary and successful senior living communities are built on the Masterpiece Living platform, which has transformed the way we view aging science and is designed to keep residents feeling engaged, honored and fulfilled. Residents and their families receive personalized reports and mobility reviews to track health progress over time. They also gain peace of mind knowing everyone’s goals are being met. An individual’s aging journey is dictated by their actions and attitude. Salus gives participants measurement tools to become more aware of the impact of everyday lifestyle choices and gain a clear path to meeting their goals. Our programs for residents, supported by more than 650 hours of scientific development, support a successful culture through engagement, socialization and physical and mental stimulation. And because residents and staff help to customize these programs, each of the community’s events and activities are continually evolving and unique. In addition to programming, tracking and road maps, both residents and families gain access to the secure Masterpiece Living website, filled with exclusive information and content. All levels of management – from housekeeping and dining to wellness – are encouraged to engage with residents and form a true community. Staff at every Solvere community are empowered to share their own unique talents and slow down to take the time to get to know each person and positively impact and monitor the health, well-being and safety of the residents. Everyone deserves to be treated with respect and dignity and to be given opportunities to thrive and lead a life that flows with purpose and meaning. Valeo by Solvere is part of our Salus by Solvere pillar dedicated to memory care. Valeo, Latin for “to thrive,” aligns with the Salus by Solvere holistic approach to wellness. It is specifically tailored to those with memory impairments and integrates all facets of a residents’ life in its approach to wellness through the Solvere Signature Programs. Individuals who build a career at Solvere’s memory care communities are filled with optimism and a genuine desire to help others. You don’t just work here – you care, motivate and engage. Our industry-leading training programs teach all staff — even non-clinically licensed employees such as operations, dining or housekeeping — how to compassionately support the day-to-day needs of residents with memory impairments while finding ways to engage with them. Our methods and leadership give staff permission to slow down, make connections and gain a deeper understanding of residents’ lives. Every person on staff — from housekeepers to bookkeepers to the kitchen and wellness teams — are considered care providers in the community and are trained to go above and beyond. Staff take time to truly get to know each resident, and work every day to create moments of joy. Employees are encouraged to blend personal interests and experiences with the lives of residents, lead group activities and interact on a regular basis. Residents have endless opportunities to stay engaged in positive experiences, yet can always find privacy and quiet time when they need it.